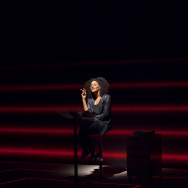 A scene from the virtual reality experience "Raising a Ruckus." The movie company IMAX is best known for big screen entertainment. But as the film industry struggles with losing audiences to streaming and mobile content, IMAX is going virtual. One of their initiatives is the IMAX Virtual Reality (VR) Centre — a "location-based" destination that provides cinematic VR experiences in an arcade setting. 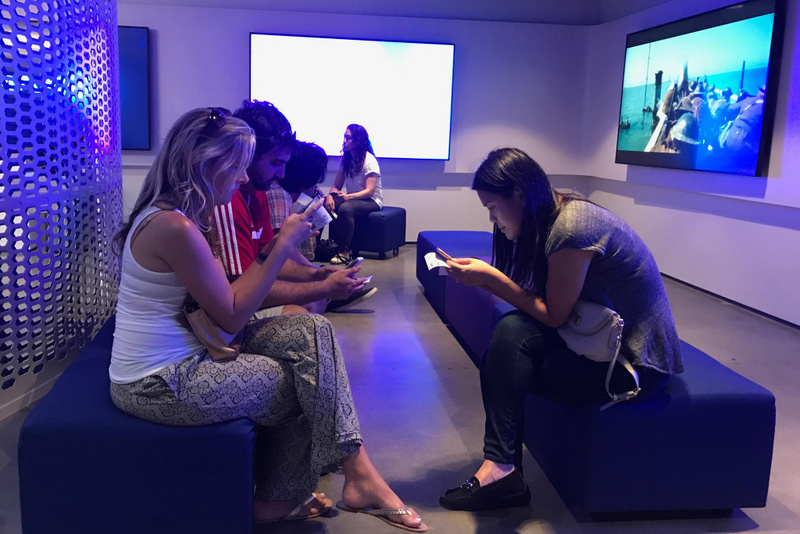 Visitors buy tickets for VR experiences that are scheduled like movie showtimes, but most experiences are interactive and multi-player. Visitors even have to sign a waiver in case of an accident on a virtual adventure. 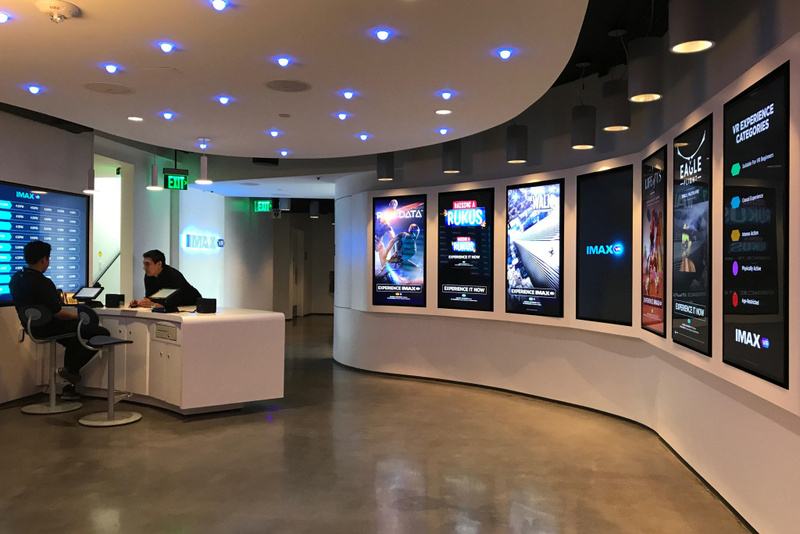 The lobby of the IMAX VR Centre in Los Angeles. 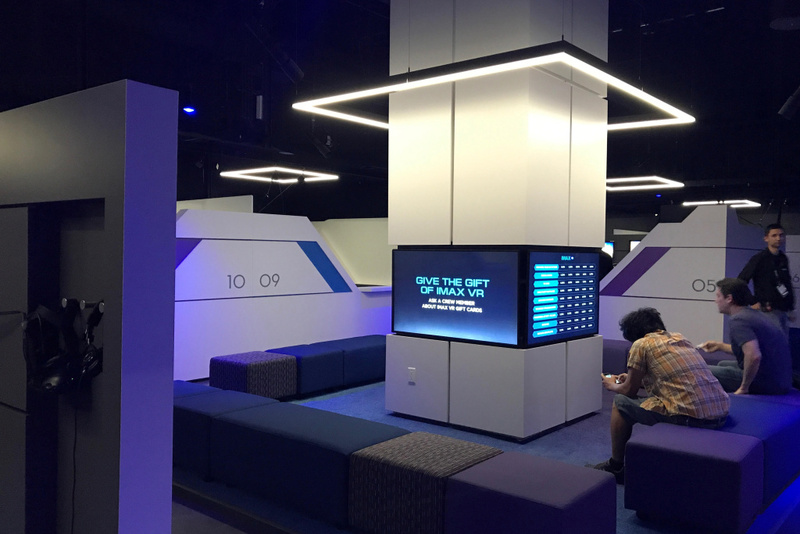 Inside the main room are "pods," walled-off spaces that each feature a different VR experience, many based on movies like "John Wick" and "Star Wars." In "The Walk," a viewer can experience the thrill of traversing a tightrope across the Twin Towers of the World Trade Center in New York City. The experience is modeled after a pivotal scene in "The Walk," the film that portrayed the real-life feat accomplished by French high-wire artist Philippe Petit in 1974. Paola Mardo tries "The Walk" VR experience at the IMAX VR Centre in Los Angeles. The Centre also features original VR productions such as "Raising a Ruckus," described by an attendant as a "roller-coaster meets a movie." 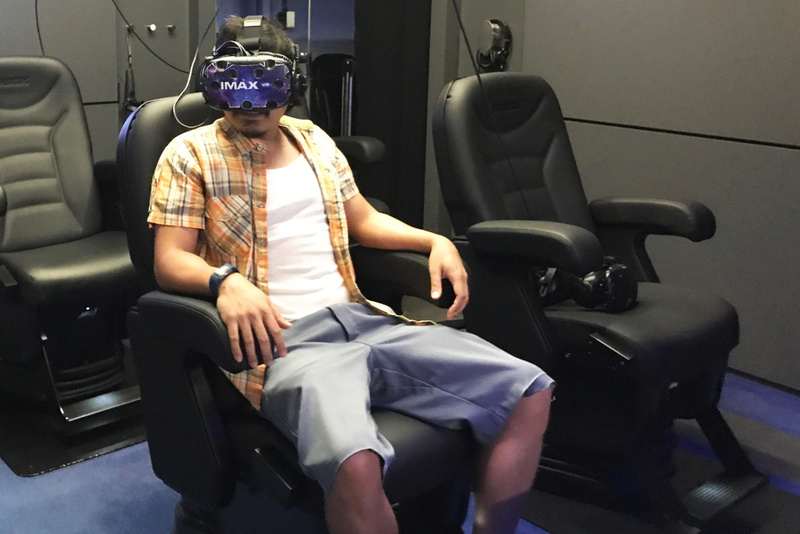 The viewer sits in a D-box chair — a movie theater seat that vibrates during the experience — then straps on a virtual reality headset and headphones to tune out of the real world and enter a virtual one. 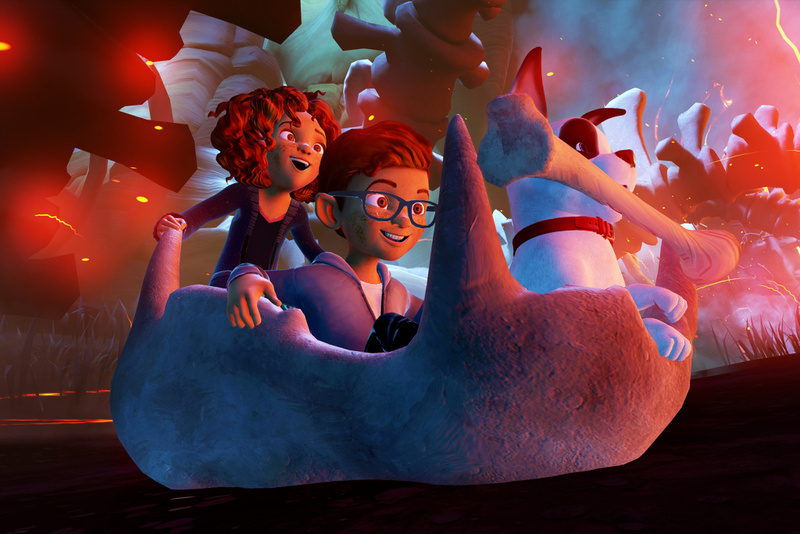 In "Raising a Ruckus," the viewer follows a brother and sister as they go on an adventure with their magical dog, Ruckus. 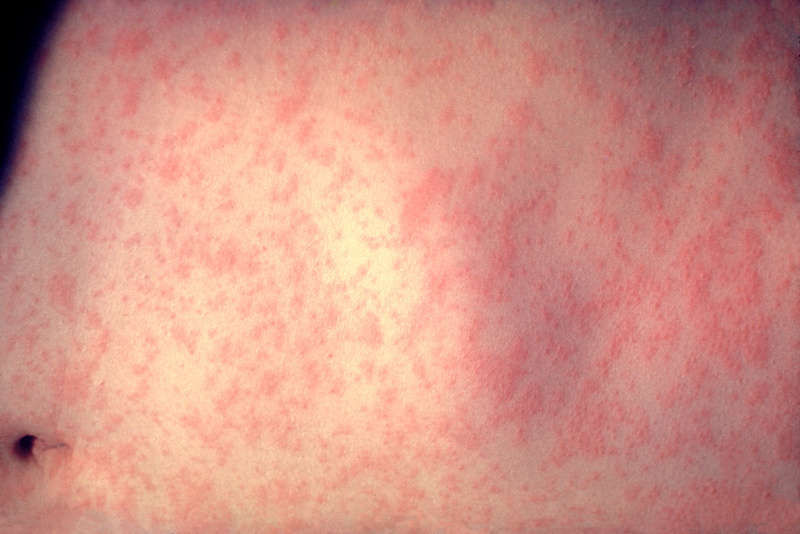 The experience costs $10 and runs for about 12 minutes. It’s not as interactive as the "John Wick" shooting game, but the visuals are impressive. It’s like a cross between a Pixar movie and "Avatar," but in 360-degrees. Inside the IMAX VR Centre in Los Angeles. One attendee, nine-year-old Elvis O'Brien, said that, compared to an arcade, the IMAX VR Centre is "a million, trillion times better" because viewers can walk around in the experiences, versus video games where players are often seated or limited in their movements. 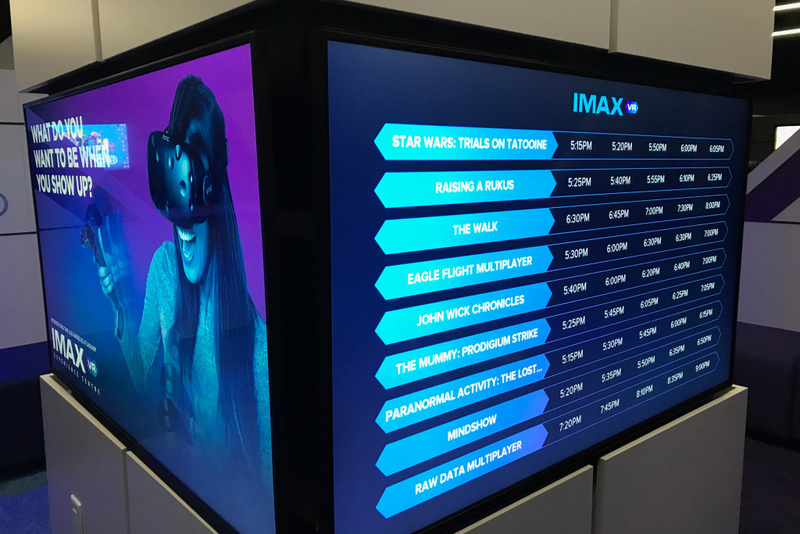 A screen displaying virtual reality experience showtimes at the IMAX VR Centre in Los Angeles. Rather than spend $2000 to invest in it at home, I think going out and spending $10 or $20 or $30 to have a first-class virtual reality experience is what people are looking for right now. Seventy percent of the people that we're bringing into the IMAX Centres are millennials. These are really, really important audiences to movie complexes and to our exhibitor partners around the world. IMAX isn’t the only player in the "location-based VR" space, but they’re most focused on delivering arcade-style VR experiences to moviegoing audiences. 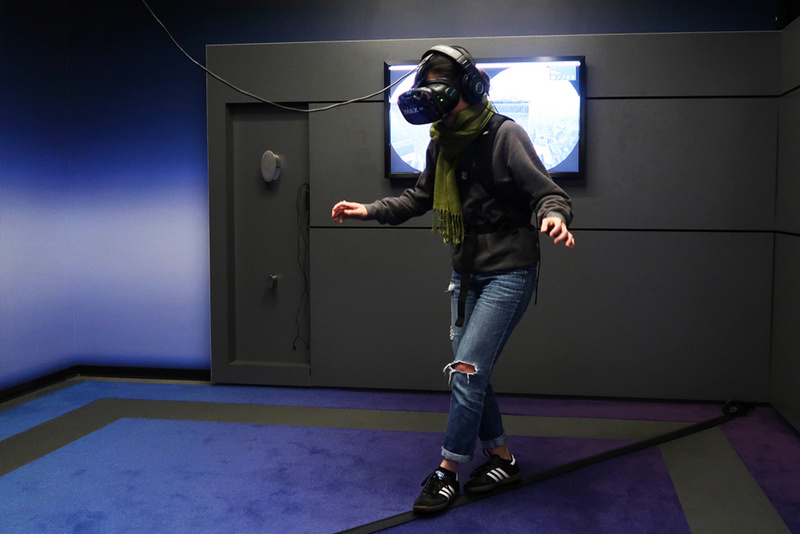 Other players include The Void, which provides wireless VR adventures where participants can move freely in a space, and Dreamscape Immersive VR, which allows participants to explore and interact with up to six people simultaneously. Dreamscape Immersive VR investors include Warner Bros., 21st Century Fox, Metro-Goldwyn-Mayer (MGM), Steven Spielberg and IMAX Corporation. IMAX has invested in other virtual reality projects including its own VR headset, the StarVR, a new VR camera it's building with Google, and a $50 million virtual reality content fund aimed at financing about 25 interactive VR experiences over the next three years. Patrick Epino tries the "Raising a Ruckus" VR experience at the IMAX VR Centre in Los Angeles. I see it as a brand new way to not just to tell stories, but to in many ways really escape — immerse yourself into fantastic new worlds or stories. It’s sort of endless. 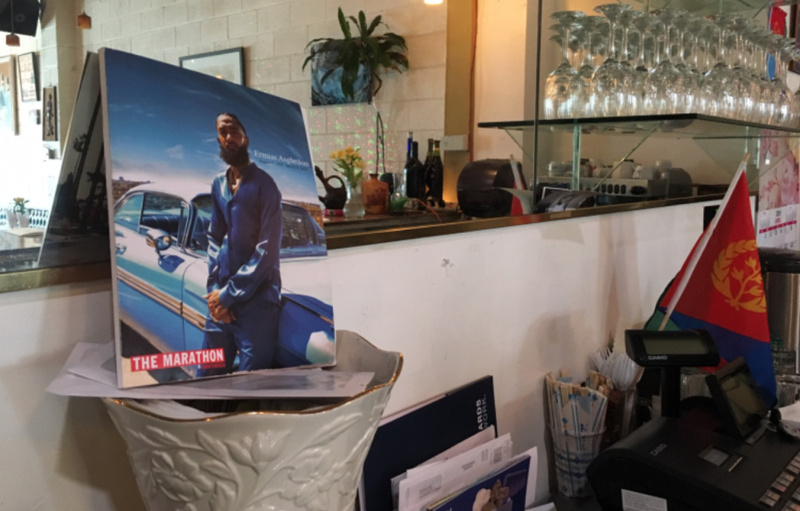 The ultimate goal to make this very much a social experience with your friends. But there’s a limitation on what we can physically do at the moment with frame rates and length of the experience and so on. I think as the technologies get wireless [and] lighter, and the quality of the resolution starts to improve, you're going to see a dramatic uptake of VR. A sign at the IMAX VR Centre in Los Angeles. This will be transformative. Everything from the big screen to your screen in your home to the way we are educated. And I think even travel can be impacted when you start thinking about teleporting. 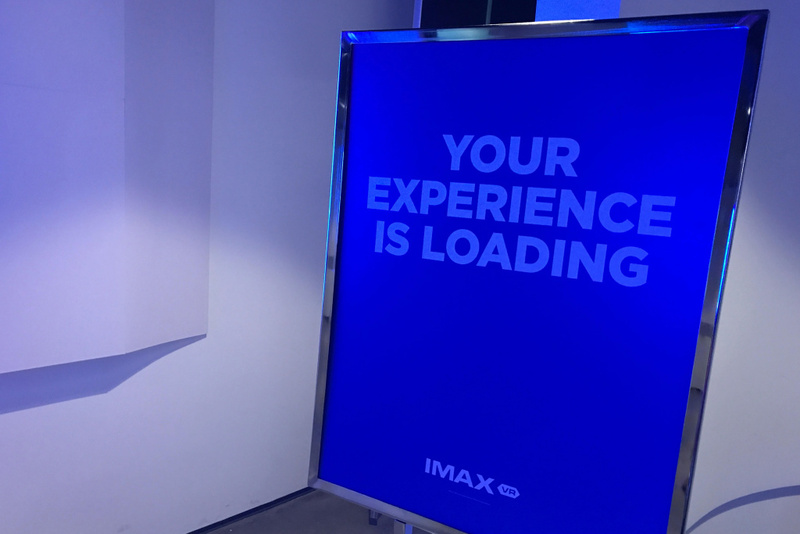 Munster says we’ll see more location-based virtual reality ventures like the IMAX VR Centre open in the next few years because they provide premium experiences consumers can't get at home, for now. 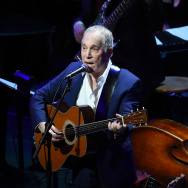 To listen to the audio version of this story, click on the player above.